Rosie Perez has been in banking for over thirty years. 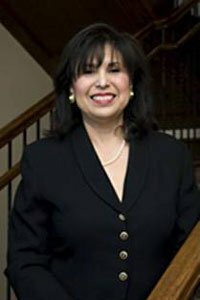 She is vice president and branch Manager of National Bank of Texas in Burleson. She completed SMU graduate school of banking “SWGSB.” She formerly worked for Burleson State Bank and other banks in Fort Worth. Her banking experience and expertise has resulted in her serving as treasurer and finance committees for the Athena Society of Burleson, BACC, Big Red Booster Club and other groups. She was honored in 2006 with the “Making a Difference Award” for the State of Texas from the Independent Bankers of Texas. This is a statewide honor for service at work and in the community. Rosie was chosen as the 1997 Athena because of her community service and her involvement n helping others. Most organizations in Burleson and the area have benefited from Rosie’s generosity of her time, energy and leadership. She is credited with helping create and implement Burleson’s Cinco de Mayo festival. She is past chairman of the Burleson Area Chamber of Commerce and has been involved with every program connected with the Chamber. She is a member of the Huguley Crystal Heart Gala fund raiser. She has been involved with the Harvest House programs such as the Angel Tree and Little Red Schoolhouse. She was chairman of the Optimist Club Neat Kids Banquet, is a former member of Burleson Business and Professional Women Organization, a mentor with the BISD program, and has been a volunteer for the American Heart Association. She was Director of the Child Advocacy Board and chairman of their golf tournament fund raiser. She was also on the Strategic Planning Committee for the City of Burleson, Civic Center Focus Group, Chisenhall Master Plan Committee, 4A & 4B Tax Committee, and Community Center Expansion Focus Group. Rosie and Richard Perez have been married for 42 years. They moved to Burleson from Fort Worth in 1969. They have five children and the eleventh grandchild will be here soon! They are members of St. Ann’s Catholic Church in Burleson and Rosie is a founding member. She has held several positions on various committees such as Finance, District Educational Improvement Council, and drug awareness. Rosie has been an asset to her church and this community since moving here. She enjoys spending time with her family, and especially her grandchildren. She also likes power shopping and traveling.